BitTorrent is a peer-to-peer file sharing protocol that has become the preferred method for distributing Linux ISO images and other large data sets. Estimates suggest that BitTorrent was responsible for 35% of all Internet traffic in November 2004, and, depending on geographic location, from 43% to 70% of regional traffic by February 2009. Do keep in mind that while BitTorrent is an efficient method for obtaining data, there is no guarantee that it is the data that you were looking for! If you are planning to install the operating system supposedly contained in the ISO image, verify the cryptographic hash of resulting download against the result from a trusted source. A cryptographic hash is the result of a mathematical calculation on any piece of data. There are several hash functions available, MD5 is rather old and SHA-1 is a minimally acceptable one for security purposes. The output of a hash is a string of bits of fixed length, 160 bits for SHA-1, and is almost always represented in base 16 or hexadecimal. The hash value will look something like this: 7ad57cadae955bd04019389d4b9c1dcb. See my page about cryptographic hash functions for far more. A torrent file like the above specifies its torrent tracker, a URL your BitTorrent client can use to find other peers currently holding needed pieces of the file. Other peers can also discover the pieces that you already have and which they need. Of course, if other peers can do that, so can agents of the entertainment industry. So, magnet links were devised. They describe a file by its content, not its location. Put another way, a magnet link does not tell you where to find a file, but how to tell if it's the file you're looking for, based on its cryptographic hash. A side effect of switching from torrent files to magnet links is a drastic reduction in the size of a site like The Pirate Bay. Typical torrent files are a few tens of thousands of bytes, while a typical magnet link is about 250 bytes. Unlike torrent files, magnet links are not only small but they are also plaintext, meaning that they can be included in e-mail messages. Below is an example magnet link. Notice that this is one very long line. The btih or BitTorrent Info Hash is the SHA1 hash encoded in base 16. We're looking for a file with SHA1 hash of 0xbe3a502bb8e06d538ed51024f4e0b125942420d2. Some BitTorrent clients use other hash values. sha1 means a Base32 encoded SHA1 hash. tth means a Tiger Tree Hash. bitprint means a SHA1 hash, a period, and a TTH hash. ed2k is used by eDonkey2000. The dn field is the "display name" that the client will show to the user. What is the thing being downloaded? 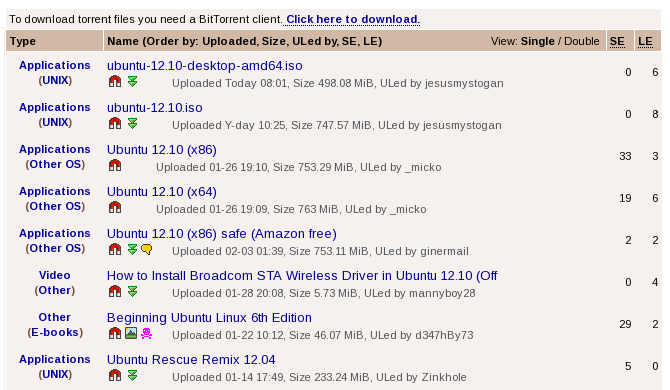 Let's say you search for Ubuntu at The Pirate Bay. Here is an example of the first few matches. Notice that the first two have both small red and white magnet icons and green arrows pointing down. These have both magnet links and torrent files. However, torrent files are on the way out at The Pirate Bay and other torrent indexing sites! Most of the indexed torrents will be like the third and fourth in the list, with nothing but magnet links. We have clicked on the first one in the list. Of course, the big green "Download" buttons do nothing of the sort, they just unleash pop-up ads. But notice the two smaller green pieces of text. The one with the magnet icon saying "Get This Torrent" will take you to the magnet link. The rapidly disappearing link "Get Torrent File" with the green download double arrow would get you the torrent file. Most indexed torrents are like this one, the third in the search list. Notice that it offers nothing but a magnet link. The note below the magnet file link says that you can fix the problem with magnet links by upgrading your torrent client. That's just a come-on that tries to get you to download a Windows executable file with a claim that it installs a replacement browser. A hex dump of that executable shows that it meddles with the Windows registry. You could convert the magnet link to a torrent file with a site like magnet2torrent.com or, possibly, magnet2torrent.me. How Can I Use Magnet Links with Firefox and Chrome? · You might need to install other software to open this address. First, decide which BitTorrent client tool you plan to use. I prefer KTorrent, although rtorrent can be very useful as it only requires a command-line interface. Get your BitTorrent client installed, and find the full path to its location. Expect something like what we see here, in either /usr/bin or /usr/local/bin. Make sure you have the gconftool-2 program installed. If not, it's in the Gconf2 package on typical Linux distributions, and in the gconf2 package on OpenBSD. $ gconftool-2 -t string -s /desktop/gnome/url-handlers/magnet/command "/usr/bin/ktorrent %s"
Close your browser, restart it, and now magnet links should be understood!